The 2008 United States presidential election in New York took place on November 4, 2008, and was part of the 2008 United States presidential election. Voters chose 31 representatives, or electors to the Electoral College, who voted for president and vice president. New York was won by Democratic nominee Barack Obama with a 26.9% margin of victory. Obama took 62.88% of the vote to McCain's 36.03%. At the time this was the highest Democratic vote share in New York State since 1964, although Obama would outperform his 2008 showing in New York just four years later in 2012. Prior to the election, all 17 news organizations considered this a state Obama would win, or otherwise considered as a safe blue state. Located in the Northeast, a region of the country that is trending heavily towards the Democrats, elections in the Empire State are dominated by the presence of the heavily populated, heavily diverse, liberal bastion of New York City where Democrats are always favored to win. Despite the fact that Hillary Rodham Clinton, the former junior U.S. Senator from New York, did not receive the Democratic presidential nomination, there appeared to be no hard feelings in the state among her constituents as the state swung even more into the Democratic column in 2008 as New York's 31 electoral college votes went to Barack Obama. Obama won all but one pre-election poll. Since September 15, Obama won each poll with a double-digit margin of victory and each with at least 55% of the vote. He won the final Marist poll with a 36-point spread. The final 3 polls averaged Obama leading 63% to 31%. John McCain raised a total of $12,582,856 in the state. Barack Obama raised $58,161,743. Obama and his interest groups spent $1,148,016. McCain and his interest groups spent just $7,310. The Republican visited the state 11 times and the Democratic ticket visited the state 4 times. New York was once reckoned as a powerful swing state with a slight Democratic lean. However, the last time the state went Republican was for Ronald Reagan in 1984. Michael Dukakis narrowly won it in 1988, but the state has not been seriously contested since then. It is now considered an uncontested blue state, and was heavily favored to vote for Obama by a significant margin. Elections in the Empire State are dominated by the presence of New York City, a Democratic stronghold for more than a century and a half. It is made up mostly of white liberals as well as ethnic and religious minorities—all voting blocs that strongly vote Democratic. Obama won Manhattan, Brooklyn and the Bronx by margins of 5-to-1 or more and carried Queens by a 3-to-1 margin. The only borough McCain carried was Staten Island, traditionally the most conservative area of the city. Obama's combined million-vote margin in the Five Boroughs would have been enough by itself to carry the state. However, Obama also dominated heavily Democratic Western New York, including Buffalo and Rochester, and the Capital District (Albany, Schenectady and Troy), as well as the increasingly Democratic Long Island and Syracuse areas. Even when New York was considered a swing state, a Republican had to carry Long Island and do reasonably well in either Western New York, the Capital District or Syracuse to make up for the massive Democratic margins in New York City. Obama also won a number of traditionally Republican-leaning counties in Upstate New York and became the first Democrat since Lyndon B. Johnson to win an outright majority of votes in the Upstate (although Democratic candidates had been consistently winning pluralities of the vote since 1992). At the same time, Democrats in New York picked up three seats in the U.S. House of Representatives in 2008. In the 13th district, which consists of Staten Island and part of Brooklyn, Democrats picked up an open seat that was vacated by former Republican Vito Fossella who resigned after he was arrested for getting a DUI. Democrat Michael McMahon solidly defeated Republican Robert Staniere by a two-to-one margin, 60.79-33.26%. His victory made the city's delegation entirely Democratic for the first time in over 70 years. In the 25th district, centered around Syracuse, Democrat Dan Maffei handily defeated Republican Dale Sweetland 55% to 42% for the open seat vacated by Republican Jim Walsh. In New York's 29th congressional district, which includes Canandaigua, Democrat Eric Massa narrowly defeated incumbent Republican Randy Kuhl by 1.7 points. This reduced the Republicans to only three of the state's 29 seats in the House—the fewest the GOP has ever won in an election. At the state level, Democrats picked up a seat in the New York State Assembly and two seats in the New York State Senate which gave Democrats control of the Senate and ultimately both chambers of the New York Legislature for the first time since 1965. This gave the Democrats complete control of New York's state government for the first time since 1936. As of the 2016 presidential election[update], this is the last election in which Chautauqua County voted for the Democratic candidate. Barack Obama dominated in fiercely Democratic New York City, taking 2,074,159 votes to John McCain's 524,787, giving Obama a 79.29% - 20.06% landslide victory citywide. Excluding the votes of New York City, Obama still would have carried New York State, but by a smaller margin. Obama would have received 2,730,786 votes to McCain's 2,227,984, giving Obama a 55.06% - 44.93% victory. Barack Obama swept 25 of the state’s 29 congressional districts in New York, including one district held by a Republican. 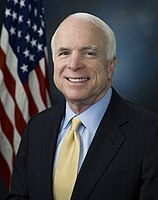 John McCain carried four districts, including two districts that simultaneously elected a Democrat to the U.S. House. Technically the voters of New York cast their ballots for electors: representatives to the Electoral College. New York is allocated 31 electors because it has 29 congressional districts and 2 senators. All candidates who appear on the ballot or qualify to receive write-in votes must submit a list of 31 electors, who pledge to vote for their candidate and his or her running mate. Whoever wins the majority of votes in the state is awarded all 31 electoral votes. Their chosen electors then vote for president and vice president. Although electors are pledged to their candidate and running mate, they are not obligated to vote for them. An elector who votes for someone other than his or her candidate is known as a faithless elector. ^ "Electoral College Map". The New York Times. Retrieved May 26, 2010. ^ "October – 2008 – CNN Political Ticker - CNN.com Blogs". CNN. Retrieved May 26, 2010. ^ "Winning the Electoral College". Fox News. April 27, 2010. ^ "Map: Campaign Ad Spending - Election Center 2008 from CNN.com". CNN. Retrieved May 26, 2010. ^ "Map: Campaign Candidate Visits - Election Center 2008 from CNN.com". CNN. Retrieved May 26, 2010. This page was last edited on 14 April 2019, at 19:32 (UTC).